Though reclaimed wood flooring is nothing new, we still had some lingering questions: Is it really eco-friendly? Where exactly does the wood come from? And perhaps most importantly, is reclaimed wood flooring a trend that’s already had its day? so where eactly does reclaimed wood flooring come from? Above: The Hudson Company used original face Reclaimed Mixed Softwoods from agrarian sources in this Vermont farmhouse. (See a discussion of new versus original face wood at the end of this post.) The Hudson Company reclaims wood from two broad sources: agrarian and industrial. Agrarian wood typically comes from barn structures—as siding, joists, beams, and flooring—and geographically from the Ohio River Valley to the northeastern and southern US. The most common species in this category is white oak. Its industrial wood comes from turn-of-the-century warehouses, water tanks, and factories. It’s generally available in larger dimensions (both width and length), and dominant species are heart pine, similar softwoods such as cedar and redwood, and sometimes maple. This wood has a more contemporary feel to it, and is a newer offering in the reclaimed wood market. 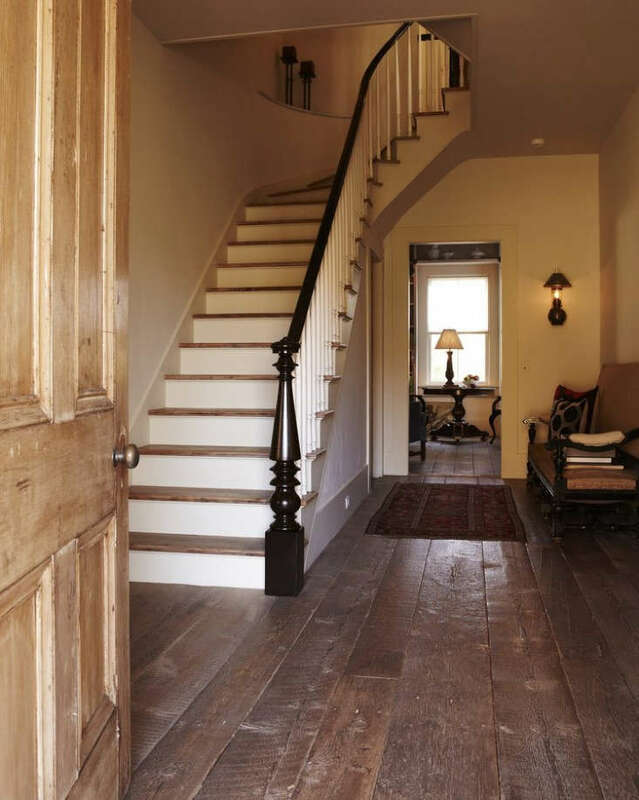 Why choose reclaimed wood flooring? Above: A mix of reclaimed original face Gray Barn Siding and Brown Board installed in a chevron pattern in the lobby of 1 Hotel Central Park, designed by AvroKo. A person might be interested in a reclaimed wood floor for one of two reasons: One, he or she is after a distinct aesthetic that can’t be achieved using anything else. This person wants the patina, texture, or character of reclaimed wood. Two, there’s an emotional or romantic tie to the history of the wood—perhaps this person is remodeling an old farmhouse and wants the wood that might have originally been used or wants to repurpose some wood found on the property. That’s how we try to help our customers choose a reclaimed wood floor: Are they trying to meet a very specific design intent or trying to replicate a historic floor—or both? Are there any practical benefits to using reclaimed wood for flooring? 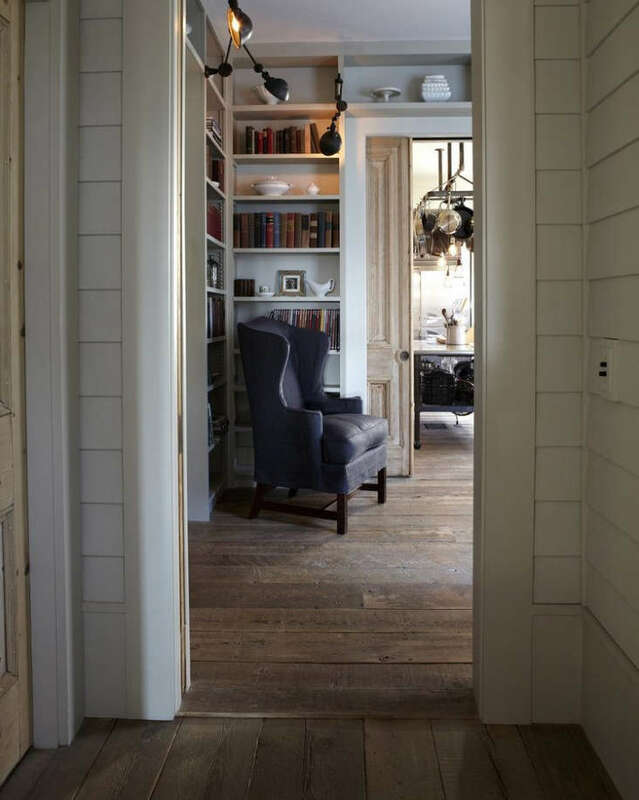 Above: The entryway of a Vermont farmhouse with Reclaimed Mixed Softwoods in a natural finish. The decision to use reclaimed wood flooring tends to be driven more by design and story considerations than by practical ones. In addition, debates about the practicality of wood floors hinge on the species of wood—is it a softwood or hardwood, for example—not whether the wood is new or old. That said, a reclaimed wood floor might encourage its owner to embrace new patina. We installed a reclaimed wood floor in a Brooklyn row house belonging to a family whose kids use the floor heavily: They play soccer on it, host parties, and do arts and crafts, and it’s perfect for them. The family is not stressed when the floor is marred or damaged. To them, it’s new “soul” adding to the patina of the wood. 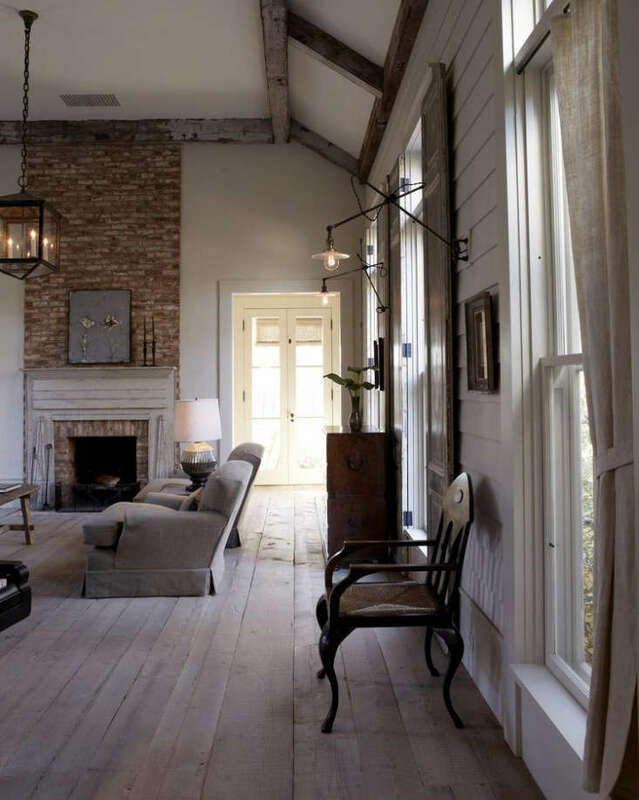 Is reclaimed wood flooring just a trend? Above: Reclaimed New Face Oak flooring sourced from barns throughout the mid-Atlantic region, in a bedroom designed by SMVRK Architects. Fifteen years ago, modern designers wanted a floor to be a cohesive, very quiet plane. They were using narrow, newly milled white oak planks—either natural or stained dark brown—and there was no allowance for knots or sap. The converse of that is what’s popular now: very long, very wide planks where knots and pith is allowed, so the plank is a sort of celebration of the tree. Reclaimed wood was at the forefront of this shift. There was a reaction to clear wood, devoid of character, and reclaimed wood is the polar opposite of that. There’s no doubt that reclaimed wood has had its pinnacle moment. It’s the star of a certain “coffee shop aesthetic” that isn’t right for every home. How can I use reclaimed wood flooring if I don’t want a farmhouse look? 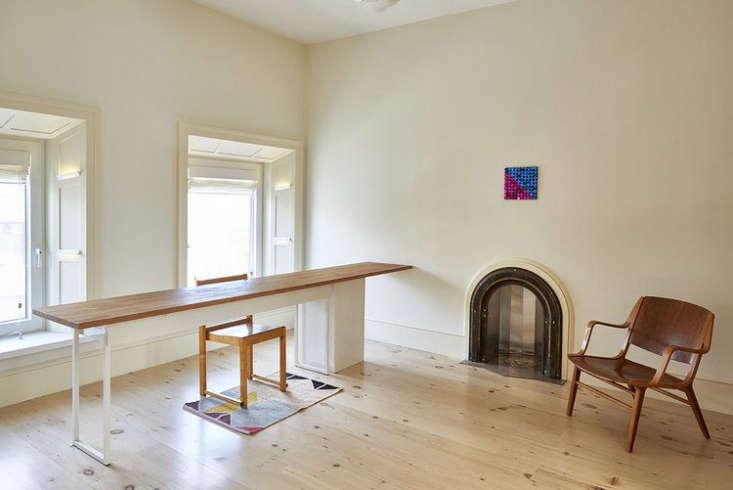 Above: Reclaimed New Face Heart Pine flooring in a Carroll Gardens home remodeled by architect Louis Mackall. There are myriad options for finishing the wood, which can steer it toward or away from a traditional or “country” look. You’ll still achieve a character that can only be had with reclaimed wood, but you can enhance or mute different characteristics of the wood to help it read as more traditional or modern. Wood flooring in a typical country aesthetic would have a high-build polyurethane finish with a lot of yellow and amber tones. But a lot of our finishes are low-sheen, and bring out the whites, grays, and fumy browns in the wood. We used reclaimed heart pine in the Whitney Museum in New York City. When used in more traditional spaces, heart pine has a lot of reds and yellows in it. But we gave it a chalk matte finish that removes some of those tones and enhances the whites within the wood. That gives is a very modern tonality, almost a Scandinavian flavor. As an alternative approach, in my eyes a lot of innovative modern designers are taking the texture and character of reclaimed wood and introducing it into spaces where it wasn’t there historically. 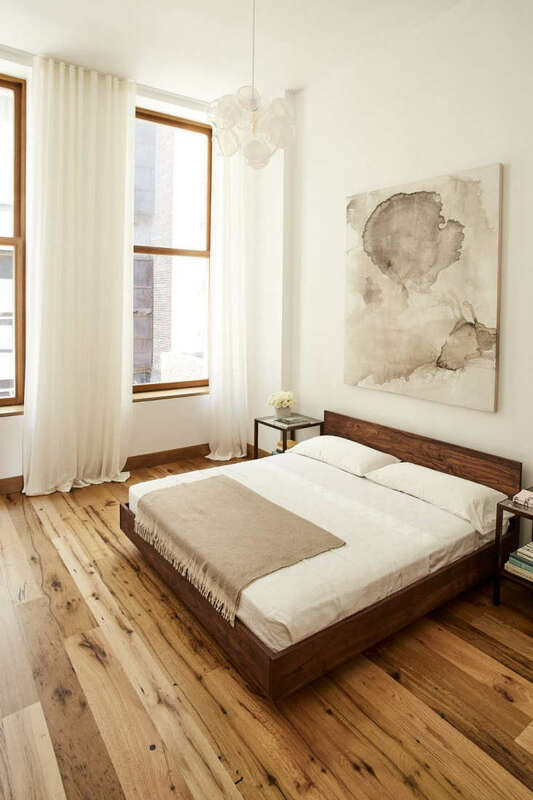 Some designers will use a reclaimed agrarian oak flooring in a high-design, modern space, because the character of the reclaimed wood offers a compelling juxtaposition to crisp, modern lines. 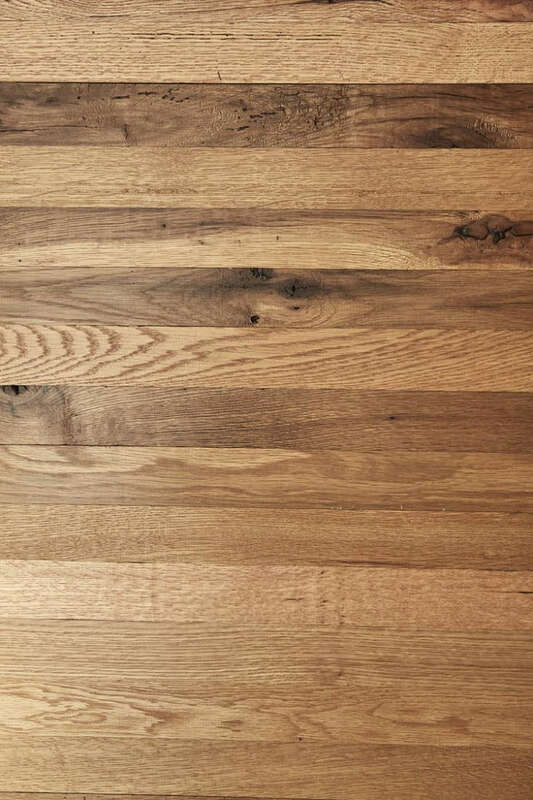 How can I ensure that a reclaimed wood floor will be timeless? I suggest looking to history when thinking of timelessness. If you’re remodeling an old structure, you’re guaranteed timelessness if you use the species of wood that would have been used in your home originally. It will always belong there, and that’s a feeling that people can capture pretty quickly when they’re in a space. Sometimes, we’ll take a beam or other wood from a site that’s being gut renovated, and turn that wood into flooring for the new occupants. That floor has an emotional tie to the history of the building. 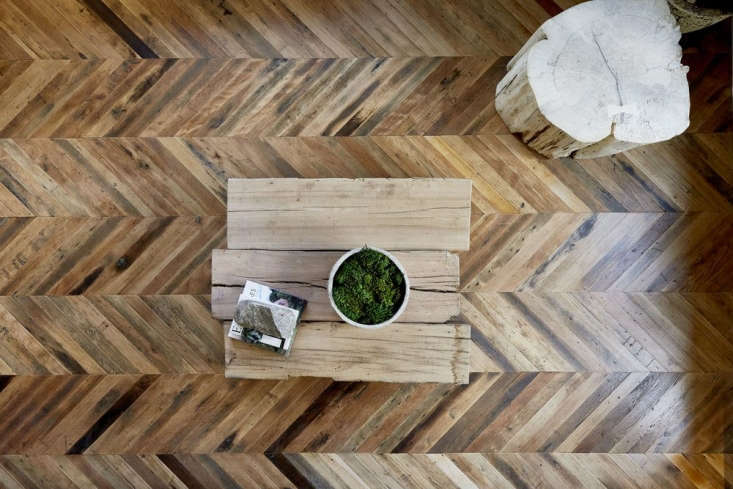 Specialty floor patterns such as herringbone, chevron, and parquetry will always be timeless designs: They are used in chateau-style French homes and in high-concept modern houses—they fit in both places. And using a reclaimed oak in a pattern like that will inject a lot of soul and history into the floor; using a new-sawn wood in these kinds of patterns can read as awkward or on-trend. Is reclaimed wood more eco-friendly than newly milled wood? Above: A farmhouse sitting room and kitchen uses unfinished Reclaimed Mixed Softwoods. It depends. If you’re after a tree species that is in need of environmental protection, such as teak, then using reclaimed wood is paramount. But if you’re after something like oak, you can still make an environmentally responsible choice with new wood if you’re careful about where it comes from. Of course, there are philosophical undercurrents to reclaimed wood that are nice: You’re diverting material from a waste stream, and prizing a resource and its history. How does reclaimed wood flooring compare to newly milled wood flooring, price-wise? Above: A detail of the Reclaimed New Face Oak flooring used in the bedroom shown above. Again, it depends—there are so many ways that pricing can be impacted, such as in installation or finishing. But generally speaking, reclaimed wood is more expensive than newly milled. Is there any industry lingo we should know? It’s helpful to know the difference between original face and new face wood. The original face is essentially the outside of any reclaimed plank or beam. Its patina is derived entirely from its history; we will brush it, clean it, and mill it to be installed as flooring, but the texture and patina the wood has gained over time is at the forefront. New face is the interior of that same plank or beam. The history you will see is anything that might have affected the interior of the beam, such as nail holes, drying fractures, and deep stains. There is some evidence of history, but at the forefront of new face wood is the tone and characteristics of the actual wood species. N.B. : This post is an update; the original story ran on June 16, 2017.